Bold and distinctive, these statement-making Bora Bora earrings are stunningly set in semi precious gems. The drops of cabochon turquoise are framed by diamond pave arches. The negative space accentuates the main stone to create a dazzling dangle. 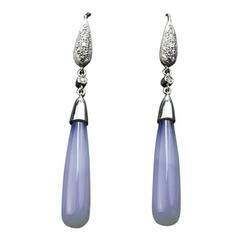 Pair these with your favorite evening dress for a red carpet look. Handcrafted of 18K Gold, Sterling Silver, White Diamonds 4.63 ct and Rubelite 20.57 ct, black rhodium finish. Bora Bora Collection is inspired by the beautiful French Polynesia in Bora Bora Island. This collection is all about using colorful gemstones, a combination of timeless and exotic designs. Each piece is centered with a single gemstone as a base and accentuated with signature pave arches. Please allow 2 to 5 weeks of delivery time as each piece is handcrafted. Each of the pieces can be customized in your favorite metal or gemstone. Contact us for more information on this piece or creating your own Meghna Jewels bespoke piece. 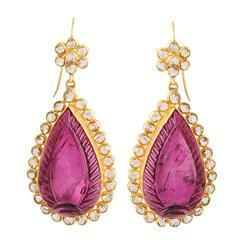 These earrings feature 13 carats of carved rubelite (pink tourmaline) surrounded by rose cut diamonds. They dangle off a rose cut diamond flower stud. Very dramatic 18CT gold drop earrings in a nod to Egyptian style with Colombian emeralds and Diamonds ,hand fabricated and pattern applied Diamonds FVVS 0.30CT Emeralds approx 0.65CT . 0.12ct Diamond 18ct White Gold Sheppard with 13mm Round Fresh Water Pearls Total Earring length 30mm.